Traditional Use: Blue, or German, chamomile has been used for nervous related ailments. Properties: Analgesic, anti-inflammatory, antiphlogistic, antispasmodic, bactericidal, carminative, cicatrizant, digestive, emmenagogue, febrifuge, fungicidal, hepatic, nerve sedative, stomachic, sudorific, vermifuge, vulnerary. Benefits: The German variety is considered to be the most therapeutic of all the Chamomiles and has an impeccable reputation among holistic practitioners. 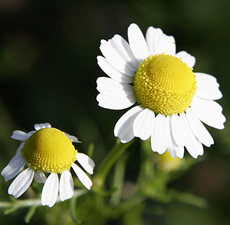 The German Chamomile is believed to be one of the most highly reputed oils for addressing skin conditions. Chamomile Essential Oil contains azulene, which gives the oil a beautiful deep blue color. The scent of this oil is mild and sweet, similar to apples, and often has a medicinal aroma with very faint bittersweet notes.Acne, arthritis, asthma, broken capillaries, burns, colic, cuts, dermatitis, dysmenorrhea, dyspepsia, eczema, headache, indigestion, insect bites, insomnia, migraine, muscular pain, muscular spasms, nausea, nervous tension, neuralgia, rashes, rheumatism, sensitive skin, sprains, stress related complaints, wounds. When adding blue chamomile to skin preparations take the color of the oil into consideration. Of Interest: Blue chamomile oil has a higher azulene content then Roman chamomile oil. This constituent also gives the oil its characteristic blue color. The azulene is not present in the fresh flower but is produced during the process of distillation. Blue Chamomile essential (Matricaria recutita) oil Has a high content of azulene, the active organic compound of chamomile, which bears a blue color. azulene has anti-inflammatory, skin healing properties. This oil is most suitable as an ingredient for skin care products. Blue chamomile is derived from the German chamomile plant, which is an upright growing annual. There are German chamomile plants that were breed for a high azulene content to use in the manufacturing of medicinal chamomile products. Roman Chamomile (Anthemis nobilis L) essential oil Is used for its skin healing properties in the manufacturing of body care products, as well as for aromatherapy. It has a very pleasant, soothing, apple-like aroma. The Roman chamomile plant is a low growing, perennial ground cover. Moroccan Chamomile essential oil (Tanacetum annum) Is not from a true chamomile plant. It is used mainly in perfume blends, and for aromatherapy. The plant is an annual that grows in the Mediterranean and in the Middle East. This is a product new to the market, it does not have a long history of traditional uses like true chamomile.